There are a few artists that I love, but whose work I am afraid to try to recreate. (Matisse is one of these artists.) When the thing that inspires you is a masterpiece – something so beautiful and famous and even spiritual – it is unbelievably frightening to think that you may not be able to do it justice. 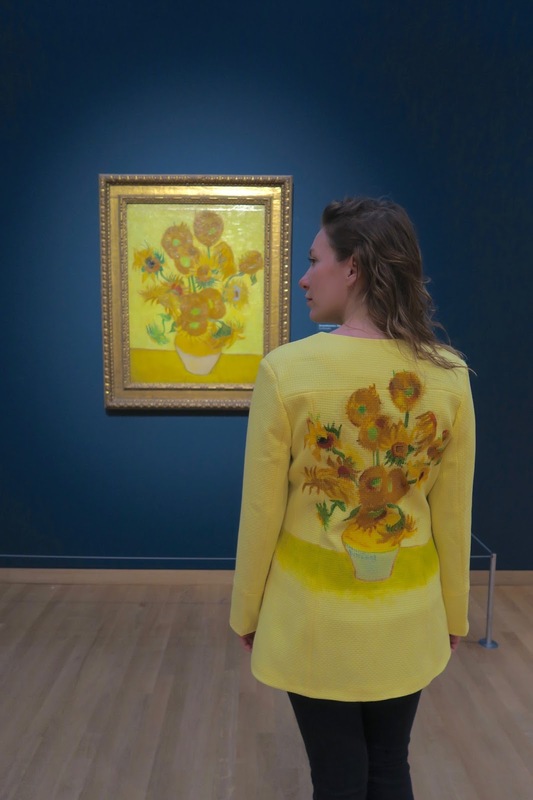 In preparation for my visit to Amsterdam, I began working on a jacket inspired by Vincent Van Gogh’s masterpiece, Sunflowers, 1889, which resides at the Van Gogh Museum. I agonized for weeks before even starting the process, wondering if I’d be able to capture the essence of such a well-known and loved work of art. In the end, I spent more time creating this piece than any other Artfully Awear project before. 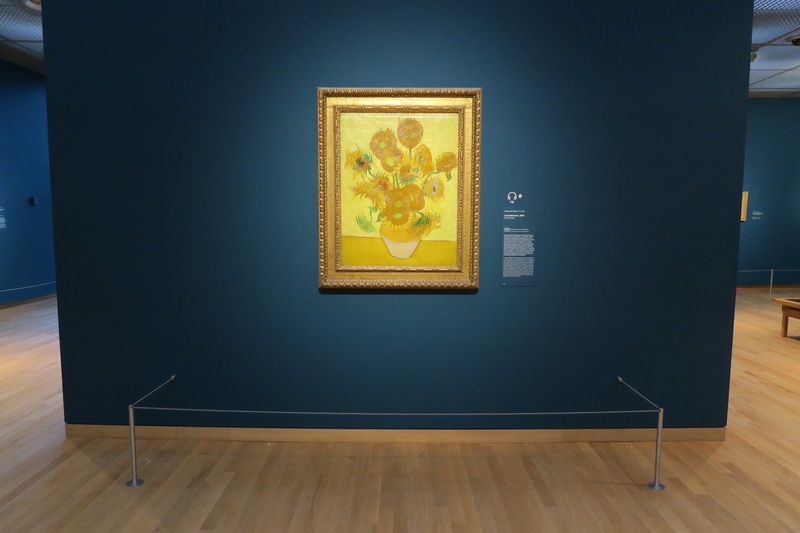 On the day I was set to meet the painting, I arrived at the museum before it opened. There was already a line of people outside waiting to get in. Meri and I went inside, straight to the second floor, where the painting lives. When the second door opened, I couldn’t believe my eyes. There, on a wall to itself, was my inspiration in all its glory. It was larger than I had pictured, even though I knew the measurements, and the colors and textures were even more vibrant and detailed than any photo could have shown. I was overwhelmed. After an emotional moment, we spent some time taking photos with the piece. After the photoshoot was finished, with a museum employee before exploring the rest of the museum. We discussed the way that social media has impacted the museum experience, and provides visitors and staff a multitude of new ways to engage with art and to share their experience with others. 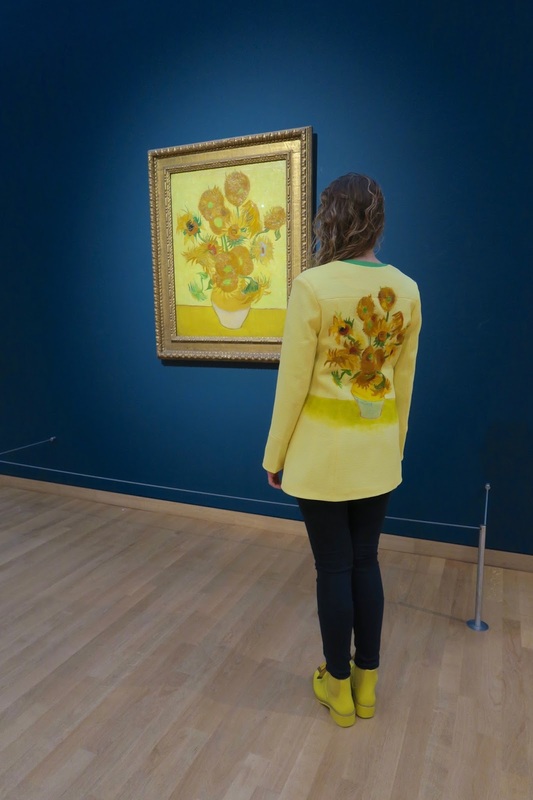 I marveled at how I was inspired by a work of art that was three thousand miles away from my home, and how I was able to connect with it through digital images – but how important and meaningful it is to actually see the painting in real life. 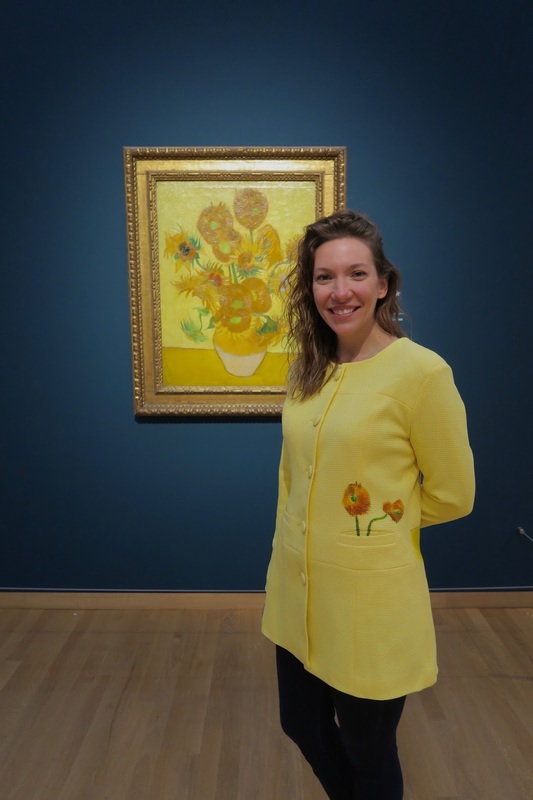 Thank you to Meri for taking the photos, to the Van Gogh Museum for having me, and, of course, to Vincent for inspiring us long after his time on the earth. Wonderful. Witty. Love those cheeky little sunflowers growing out of your pocket.